Brick-and-mortar business owners are so focused on drawing customers to their store, often times they overlook marketing to them once you’ve gotten them “into” your store. They fail to leverage in-store marketing techniques that allows them to continue the conversation once customers walk through their doors. Below, we’ll take a look at why you shouldn’t overlook in-store marketing, and how in-store marketing can positively influence your customers and business. Many companies focus their marketing budget on getting people through the door. They have the skewed thought that as long as customers are inside the store or business, the marketing portion of the sales process is done. However, nothing could further from the truth. In-Store marketing plays an important part of your sales process, and increases the number of customers who convert (as opposed to leaving empty-handed) and increases the average ticket, growing your bottom line. In-Store marketing creates a positive experience that makes customers want to return and encourages loyalty to your brand. Instead of trusting customers who are already in your store to come again, this form of marketing sets them up for multiple return visits. In-Store Marketing Creates Up-sell Opportunities. Do successful brands trust their customers to wander through their store or business and choose the best option? The answer is a resounding — No! Successful brands try to drive buying decisions by promoting a seasonal special or promotional package to customers and prospects to try new things? Up-selling customers is essential for companies to help grow their sales. If you can get your customers to spend just a few more dollars on average, you can see a significant growth in sales. The key is to tap into in-store marketing to drive these up-sells and get people to spend more. For example, clearly-displayed in-store video ads can help your customers learn about your products and certain packages. They might not have known about their options, but your in-store marketing helps them make the best decision possible. Instead of crossing your fingers and hoping customers can understand their options, you can sell them on various possibilities that benefit your bottom line. Customer education is an integral aspect of marketing and selling your products. If customers are unaware of their choices or the benefits of different options, then they’re unlikely to move beyond what they are comfortable with. A perfect example of this is that you may already experience are your “regulars” who only buy the same item when they come in, regardless of your offerings. While certainly you appreciate their loyalty, often times you may wish that they tried something new. In-Store marketing, when done effectively in your business, drives customer behavior. You can encourage people to try new things or promote seasonal specials that are only available for a short period of time. This drives demand and helps customers understand their choices beyond the basic options they select every time. Yes! In-Store Marketing Also Helps Drive Loyalty. While new customers are important for growth, building a loyal base is essential to driving sales.Business owners know that they can’t rely on new customers to drive their business. In fact, loyal customers spend an average of 67% more than new customers, so it pays to create a positive experience that brings people back. Consider using in-store video ads and overhead music and messaging to your promote your loyalty program. Your company could offer a discount to customers who join or give them a gift for signing up. This creates an incentive to sign up for your loyalty program and allows you to market to them based on their interests. The marketing cycle doesn’t end when your customers make a purchase — it actually starts all over again. If can give them a reason to come back and move them deeper into the sales funnel, this creates less work for your other marketing channels, as you already have customers who are interested in returning. Today’s customers are growing increasingly impatient and expect service within a few minutes of arriving or ordering. From customers sitting in an auto shop or doctor’s office to people ordering at a fast casual restaurant, most professionals only have a short window before their audience gets antsy. 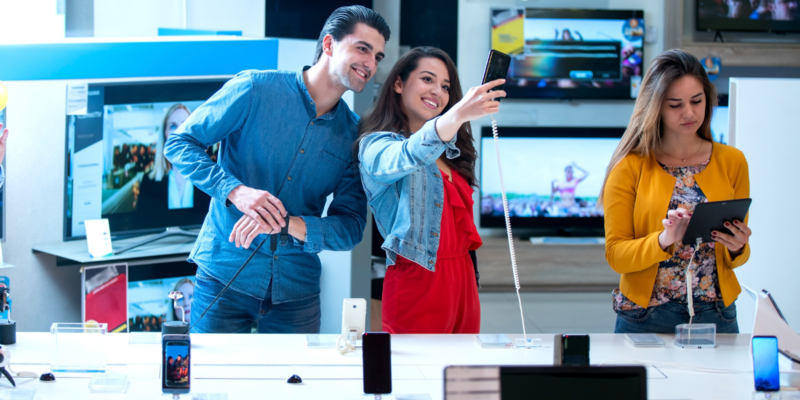 Along with up-selling customers on various products and helping them understand why they should buy from you, in-store marketing keeps people entertained and engaged while they wait. Having a private label in-store TV channel for your brand is a clear examples of this. Customers can watch highly-curated custom TV content, which keeps them engaged with your brand while being entertained at the same time. Hopefully now you understand the importance of in-store marketing, you can take steps to incorporate it into your buying process, boosting your revenue and customer engagement rates. You can connect with people in your store through loyalty promotions and other in-store marketing options. If you’re ready to tap into the power of in-store marketing for your brand, then contact Original On Hold today. We can set up a free consultation to review your individual needs and come up with a plan to keep customers engaged and excited about your business, while they’re “at” your business.